You’ll have to excuse me. 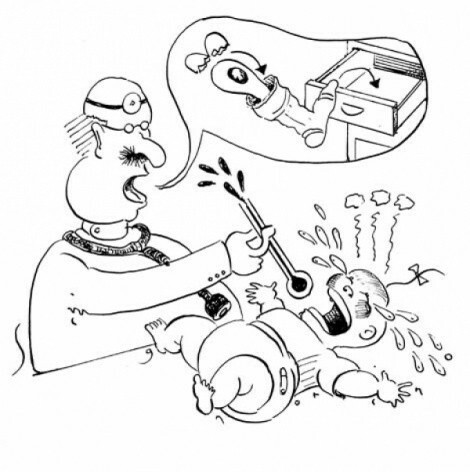 If I took my kid into the ER with a 103-degree fever and the doctor blamed it on teething, my reaction wouldn’t be, “Why were all those other doctors lying?” but rather “What’s up with this quack?” However, I concede that the belief that teething causes fever (or worse) is a deep-rooted one. Teething fears gave rise to all sorts of foolish remedies, including tying a penny on a string around the child’s neck, having a puppy lick the child’s mouth, placing a raw egg in a sock in a drawer, lancing the child’s gums, and administering purgatives, opiates, lead, or mercury salts. To be fair, infant mortality was high in the old days; it’s not like people were imagining these deaths. However, we see a pattern that persists to this day: If you couldn’t figure out what was wrong with a kid, you blamed it on the teeth. While most modern parents have gotten past the idea that baby’s first tooth is a holler to the angel of death, many think teething can cause fever, diarrhea and infection. Recent surveys show that about 75 percent of parents of young children believe teething and fever are associated, and so do 83 percent of nurses and 64 percent of pediatric dentists. • An Israeli study found that of 46 babies studied over a six-month period, 20 had at least a mild fever (99.5 degrees Fahrenheit) the day a tooth emerged and 15 had a fever of at least 100.4. The average temperature on tooth-emergence day was 99.7. • A study of 111 children who produced a total of 475 teeth found a notably greater incidence of drooling, gum-rubbing, irritability, and decreased appetite on or near tooth-emergence day, and one baby in six ran a temperature above 100. Then again, of more than 2,000 days where children had temperatures above 100, only 64 of those days were when a kid cut a tooth. Only one tooth made an appearance on a day when the kid’s temperature was above 103. • Both studies above relied on parents to take their child’s temperature and record symptoms. This kind of data has a high flake factor. Many parents don’t know how to take a child’s temperature properly, don’t understand what constitutes a fever, and generally aren’t reliable observers of what’s up with their babies. • Recognizing such failings, Australian researchers observed 21 children at three day care centers for seven months. A dental therapist determined when teeth appeared and took temperatures. Staff and parents filled out daily questionnaires on symptoms. Results: 1. Most parents thought their kids had teething symptoms, and half thought they had a fever. 2. By and large, the kids didn’t. An analysis of staff-collected data found no relation between teething and fever, and minimal relation with any other symptom. Conclusion: “It is time to relinquish our long-held cultural beliefs about teething [and] acknowledge that…tooth eruption is not strongly associated with significant symptoms” (Wake et al, Pediatrics, 2000). I’ll grant you that basing sweeping conclusions on 21 kids is a stretch. However, even if we take the first two studies at face value, teething is associated with low fever at worst, arguably due to gum inflammation. High fever on a teething day is rare and most likely is due to something besides teeth. If you’ve got an MD blithely telling you a temperature of 103.4 is caused by an incoming molar, that’s a good sign you’re dealing with somebody who doesn’t know what’s going on, and you’d be smart to talk to someone else. Subscribe to the Straight Dope podcast at the iTunes Store. And send questions to Cecil via StraightDope.com or write him at the Chicago Reader, 11 E. Illinois, Chicago 60611.